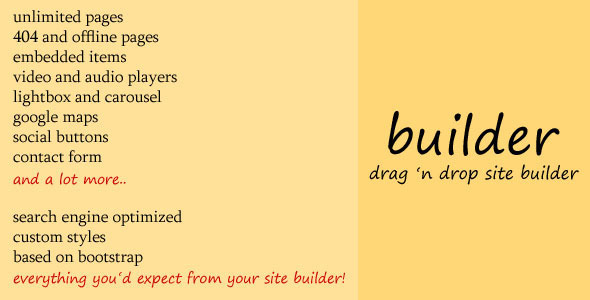 Builder is a drag ‘n drop site builder created with PHP.. It uses Bootstrap 3 framework for the layout, Mysql for saving components and layout information, Jquery UI and Gridster for interface management. Builder users will have no need to edit any code to get a professional web site, and can have a full web site up and running in minutes. This entry was posted in Uncategorized and tagged bootstrap, builder, database, drag, drop, feeds, forms, gridster, media, mysql, php, scripts, site builder, sliders by Acty. Bookmark the permalink.